The final part covering my 12 month service of my Nugent. In some respects, it’s getting a much better playfield clean than when I rebuilt it this time last year. 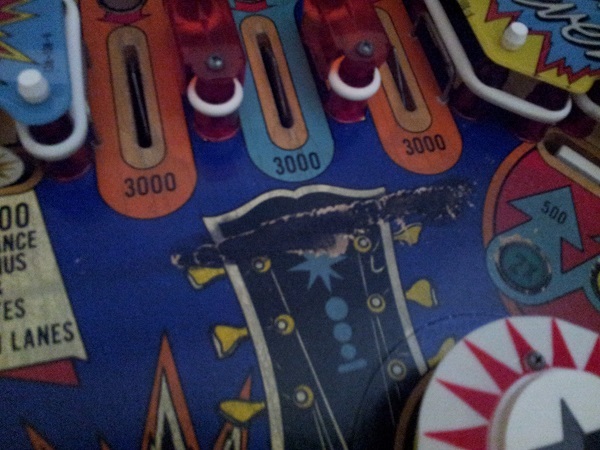 Although I replaced many old and worn parts, I didn’t give enough attention to the surface of the playfield. It was wiped down but I didn’t have the knowledge or confidence at the time to do more. The apron area has been taken care of, as has the lower playfield area. Now on to the upper half. First step was to remove everything. This includes the rebound rubber and gates. There is quite a bit of crap built up already. The 12 months service of my Nugent machine continues. First up, I’ll expand on the area of the playfield which is largely responsible for spreading crap around the machine. 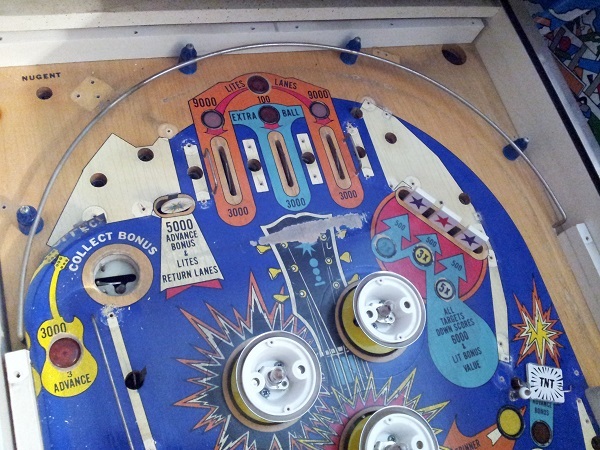 At the top of the playfield there is a large wear patch that extends for about 10cm between the bonus saucer and the multiplier drop targets. This area seems to be a common wear zone as I’ve seen other Nugent playfields with damage in this area (although the others have not been as bad as this). It’s now been 12 months since I came into possession of my first pinball machine. The Nugent has received a lot of play time over the year. 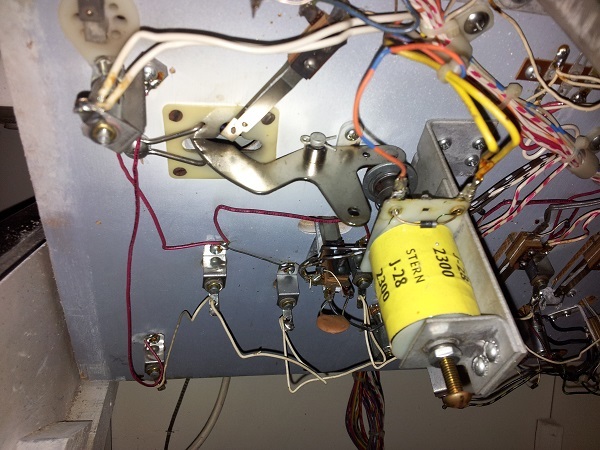 I rebuilt the machine back in January / February this year and at the time was learning a lot about how pinball machines worked in general and the ways to clean & service them. Since then I’ve gone onto restore a Fireball Classic and also well underway with a Pinbot machine. I’ve learnt a lot since working on this machine and I decided that I’d revisit my Nugent for a 12 month service. I don’t plan to rebuild the machine like I did last time. It’s running really well, but needs a bit of a surface level clean. There are a few small issues I’d like to sort out (very minor) and I’d also like to apply some of the skills I’ve learnt since working on it to improve it further. The first thing to look at will be the plastics. A number of the pieces are warped. On the home stretch now – the last part of the game under the hood to receive some attention is the saucer kicker. I haven’t really had to worry about this at all since it’s working fine from day one. But like everything else, it can do with a clean and this is a chance to learn some more about it. The drop targets – one of the final elements of the game to receive my attention. The Nugent playfield has two banks of 3 drop targets. 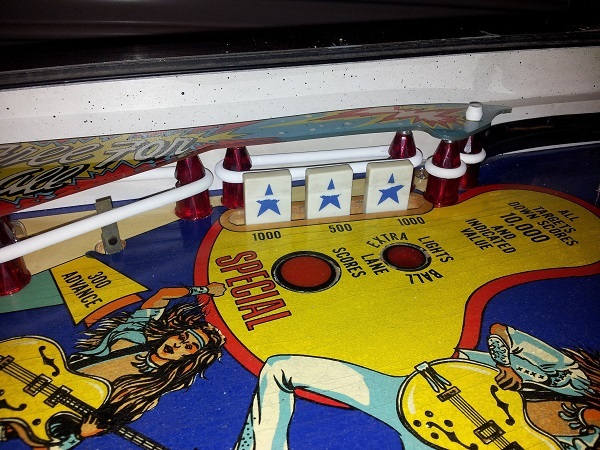 The first set (located on the left of the playfield) control the special bonus (which is an extra ball & 100,000 points). The second is located on the upper right and controls the bonus multiplier (x2, x3 and x5). Both sets are functional, although sometimes it does not detect when all 3 targets have been dropped (more on this later). The blue star decal on all 6 targets is worn and the white has faded over time. 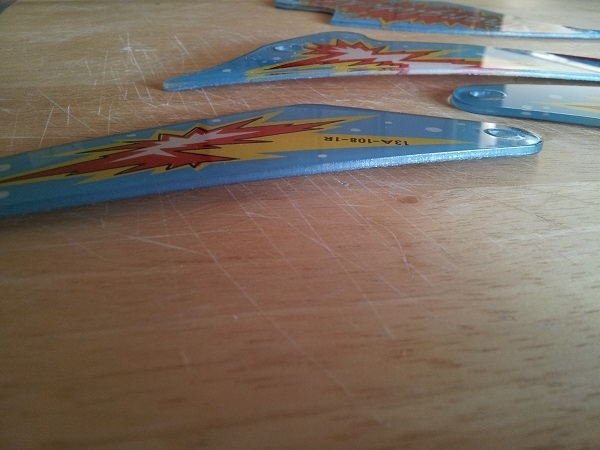 There is also some dirt build up on the targets and the assembly under the playfield.